First of all, you have the fact that there is water everywhere, and generally speaking water and metal dont get a long. In addition to the water rich environment, you have the added challenge of construction difficulties. If youre installing railing on a walkway around water, you might only be able to get access from one side. To further complicate matters, in the water industry you often have complex pieces of machinery that need to be protected, making for complicated paths for the railing to get around the equipment. Finally on top of all this you usually need to add a toe board or kick plate to keep things from being kicked into water. Needless to say, installing railing around water can be a complicated process. 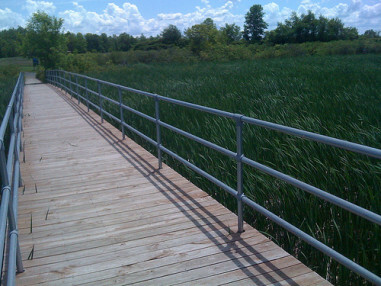 Here at Simplified Safety we utilized Kee Klamp and Kee Lite fittings to design steel or aluminum railings that meet the complex challenges of installing railing in water rich environments. For starters, the fittings and pipe are designed to resist corrosion. No welding, means a simpler, faster and more cost-effective install. When using steel, the protective coating of the railing is not damaged in the installation process. This makes the railing last much longer when exposed to water. Construction is made easier through the use of simple fittings. No welding required. In most cases a few simple tools and a drill is all that is required to complete the installation. Most installations can be completed by in-house maintenance staff, rather then higher priced technical labor. Even in the case where you need to outsource installation, the simple method requires only standard contractors, rather than specialized labor. The simplicity of installation also means that the railing will be ready faster. Getting around complex machinery is as simple as finding the right fittings and cutting the pipe to length. No need for complex pipe bends! The fittings come in many different angles to help get your railing into those difficult locations. Toe board and kick plate is much easier. Using a new base fitting, toe board can be attached to fitting with some simple stainless steel hardware that we provide. Even without the fitting, we provide a easy to use adapter kit which attaches the toe board to the uprights without welding. Hopefully this review demonstrates why railings built with Kee fittings are superior to installing a welded handrail. Our sales engineers will be glad to help provide you with assistance when specifying or acquiring the necessary equipment to install a handrail. Please contact us with any questions. 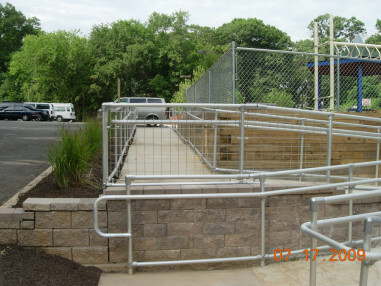 Find out more about our OSHA compliant railings and the our products that apply to the Municipal and Water Industries.